Mochi cookies are a rare sight to see, but it is about time rice flour is the star of the show and takes its own form. A cookie that is crispy, smooth, chewy, light, and most importantly delicious. My original intent of engineering a mochi cookie was to... well engineer a cookie. I started with a Matcha Mochi Cupcake recipe that I knew was delicious. It had a crisp texture on top and a chewy mochi center. If i could increase the crispiness to chewy ratio I would have something great. I broke down the recipe and looked into the water, fat and protein content of all my ingredients keeping track of details such as an egg is composed of 66.6% egg whites, 90% of which is water. Where did this get me? I was left with a bunch of numbers on a spreadsheet, cookieless and sad. I just needed to start baking. It took me 4 trials to get to my Final Recipe. 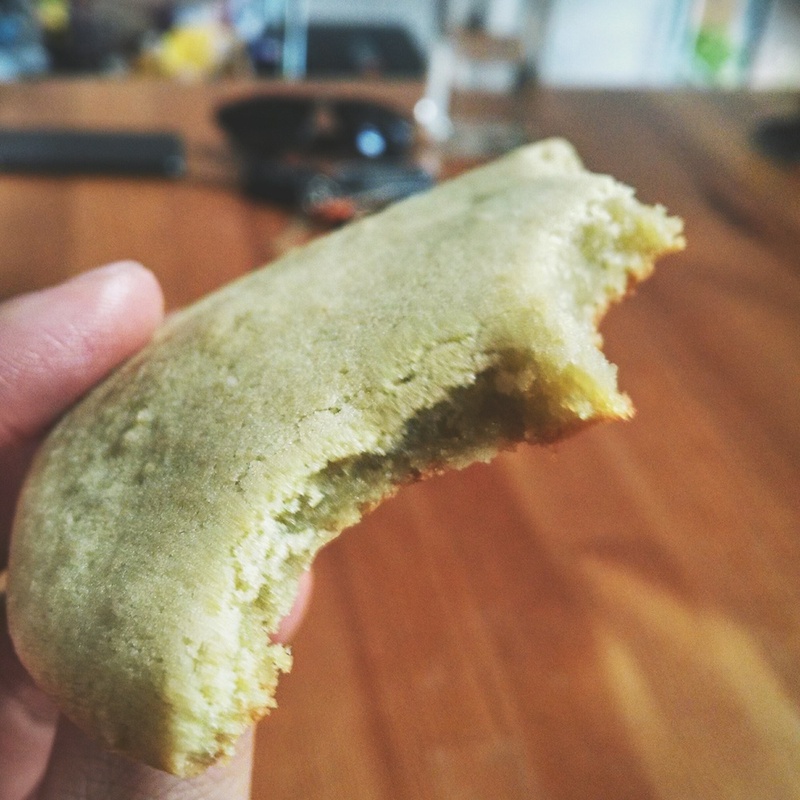 Having baked the Matcha Mochi Cupcake recipe many times, I recalled that the batter was watery. Placing this on a baking sheet will create some problems. Your dough should hold together in a ball, and as you bake it, it should slowly spread. To remedy this problem the first thing was to reduce the milk content. Second, I substituted butter with oil by weight. By using butter, I can cream it with sugar to produce a fluffy and structured base for my dry and wet ingredients. Oil and butter can be used interchangeably with a few textural differences. An over simplified observation: Creamed butter will give you the texture of a cake while oil creates a texture similar to muffins. After I decided on my approach, I converted any volumetric measurements to weight based measurements. This allows for consistency and reproducible. A 100 grams of flour will always be a 100 grams of flour, but a cup of flour can vary up to 10% by weight. This recipe however isn't as sensitive as other ingredients, so eye balling is allowed. Preheat your oven for 375°F. Bake your cookie until your cookie is just barely brown on the edges. About 15-20 minutes. The result: The cookies were delicious out of the oven. My friends surprisingly ate seconds right away. Pretty good for a first try. They were a little crisp on the outside with a nice chewy texture. The only downside to the cookie is that it lost its crispness very quickly. I believe this is due to the lack of gluten, but I will have to look into this. After tasting my first cookie and getting feedback, the general consensus was that the cookie wasn't crisp after it cooled down. Everyone loved the chewy texture and light flavor but I wanted the best of both worlds. I thought that the ingredients were not hydrated enough resulting in highly hygroscopic cookie (absorbing and retaining water from the atmosphere), so I decided to increase the milk by 33% (1/4 cup) and see how the results vary. The recipe and directions are identical to the recipe above with the addition of extra milk. Preheat your oven for 375°F (version 2) or 400°F (version 3). I expected a very liquid dough with the milk added, but it had the consistency to a meringue, light and fluffy. I baked Ver. 2 at 375°F for 25 minutes just until the sides were brown (similar to Ver. 1). Once in the even it quickly spread almost as if it was ice cream. The cookie looked promising once it came out the oven, crisp around the edges, but as soon as I picked it up it flopped over instantly. A little disappointing. In attempts to salvage my cookie, I cranked up the heat up to 400°F and wished for the best. I waited a little longer until the cookie browned radially towards the center for 1 centimeter. I took it out and they were flop-less, crisp, and lovely. I now had two delicious but contrasting cookies. One that was true to its innate mochi form, stretchy and chewy. The other very close to a traditional sugar cookie, which reminded my of a delicious fresh baked fortune cookie. Both however were thin, which didn't provide the bite that I desire in a cookie. After polling my friends and co-workers, everyone was split 50-50. Some loved the mochi texture of Ver. 2 and others like the crispness of Ver. 3. One thing for sure was the extra milk boosted the creamy flavor of the cookie. This lead me to my next idea and pay homage to Christina Tosi of Milk Bar: Milk Powder. After 3 attempts at the mochi cookie, I finally saw a path to greatness. Taking pieces and ideas from each version and piecing them into a cookie was similar to Frankenstein and his monster (both which happen to be green). Version 1 had a good proportion of ingredients and yielded a dough that didn't melt quickly in the oven and produced cookies with the right thickness. Version 3 had a higher temperature ideal for getting a crisp texture. Version 2&3 had a creamier texture with higher milk content. Follow the steps set in Ver. 1 and bake at 400°F for 20-25 minutes until edges are brown. This is by far the best version of the cookie that I have made. Chewy, crisp, light and delicious. If you have any cookies left after baking, place in an air tight container and toast briefly before serving. It is best to eat the cookie within 2 day, as they stale real quick. Try varying the cooking time and enjoy the different textures that can be achieved by the recipe. While I am proud of version 4 of the recipe, there are many more ideas written down and left to explore (hint: it involves tea leaves and red beans).